TO GIVE YOU ANOTHER OPTION. 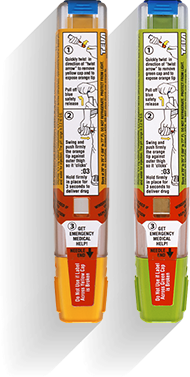 Teva's generic epinephrine auto-injectors, equivalent to EpiPen® and EpiPen Jr® (epinephrine injection, USP) Auto-Injectors. What does "therapeutically equivalent to EpiPen®" mean? Teva's Epinephrine Auto-Injector has the same active ingredient that is used in EpiPen ®.It works in the body the same way as EpiPen ® for the treatment of an allergic emergency. The epinephrine in Teva’s Epinephrine Auto-Injector works the same way in your body as EpiPen®. The FDA approved Teva’s Epinephrine Auto-Injector as therapeutically equivalent to EpiPen®. This means you can ask for it as a generic alternative to EpiPen® at your pharmacy. Epinephrine Injection (Auto-Injector) is a prescription medicine in a disposable, prefilled automatic injection device (auto-injector) used to treat life-threatening, allergic emergencies including anaphylaxis in people who are at risk for or have a history of serious allergic emergencies. Each device contains a single dose of epinephrine. Teva's Epinephrine Auto-Injector is meant for immediate use during an emergency and does not replace medical care or hospital care. You should get emergency help right away after using epinephrine. Only a healthcare provider should give additional doses of epinephrine if you need more than 2 injections for a single anaphylaxis episode. Enter your email to be notified when Teva's Epinephrine Auto-Injector, 0.15 mg is available. Teva’s Epinephrine Auto-Injector is FDA-approved in 2 strengths. The 0.3 mg strength is equivalent to EpiPen® for patients who weigh about 66 lbs (30 kg) or more. The 0.15 mg strength is equivalent to EpiPen Jr® for patients who weigh about 33-66 lbs (15-30 kg). Your healthcare provider will prescribe the appropriate strength. Tell your healthcare provider about all known allergies, all your medical conditions, and all medicines you take, especially if you take asthma medicines. If you have certain medical conditions, or take certain medicines, your condition may get worse or you may have longer lasting side effects when you use your epinephrine auto-injector. These side effects may go away with rest. Tell your healthcare provider if you have any side effect that bothers you or does not go away. We are the world's largest manufacturer of FDA-approved generic medicines. Here at Teva, we are committed to providing high-quality generic medicines to millions of patients around the world. It is our passion to produce generic medicines at costs that can help make them available to those who need them. Teva leads the way in generics. Register for alerts when new Teva generics launch. Learn how Teva became a leader in generics. Anaphylaxis can be life threatening, can happen within minutes, and can be caused by stinging and biting insects, allergy injections, foods, medicines, exercise, or unknown causes. Always carry your Epinephrine Injection (Auto-Injector) with you because you may not know when anaphylaxis may happen. Use Epinephrine Injection (Auto-Injector) right away. Get emergency medical help right away. You may need further medical attention. You may need to use a second Epinephrine Injection (Auto-Injector) if symptoms continue or recur. Only a healthcare provider should give additional doses of epinephrine if you need more than 2 injections for a single anaphylaxis episode. Epinephrine Injection (Auto-Injector) should only be injected into the middle of your outer thigh (upper leg). Do not inject the Epinephrine Injection (Auto-Injector) into your: veins, buttocks, fingers, toes, hands, or feet. If you accidentally inject Epinephrine Injection (Auto-Injector) into any other part of your body, go to the nearest emergency room right away. Tell the healthcare provider where on your body you received the accidental injection. Rarely, patients who have used Epinephrine Injection (Auto-Injector) may develop infections at the injection site within a few days of an injection. Some of these infections can be serious. Call your healthcare provider right away if you have any of the following at an injection site: redness that does not go away, swelling, tenderness, or the area feels warm to the touch. Cuts on the skin, bent needles, and needles that remain in the skin after the injection, have happened in young children who do not cooperate and kick or move during an injection. If you inject a young child with Epinephrine Injection (Auto-Injector), hold their leg firmly in place before and during the injection to prevent injuries. Ask your healthcare provider to show you how to properly hold the leg of a young child during injection. If you have certain medical conditions, or take certain medicines, your condition may get worse or you may have longer lasting side effects when you use your Epinephrine Injection (Auto-Injector). Tell your healthcare provider about all known allergies, all your medical conditions and all the medicines you take, especially if you take asthma medicines. Common side effects of Epinephrine Injection (Auto-Injector) include: fast, irregular or “pounding” heartbeat; sweating; headache; weakness; shakiness; paleness; feelings of over excitement, nervousness or anxiety; dizziness; nausea or vomiting; and breathing problems. These side effects may go away with rest. These are not all the possible side effects of Epinephrine Injection (Auto-Injector). For more information, ask your healthcare provider or pharmacist. Call your healthcare provider for medical advice about side effects. You may report side effects to FDA at 1-800-FDA-1088. Epinephrine Injection (Auto-Injector) is for immediate self (or caregiver) administration and does not take the place of emergency medical care. You should get emergency help right away after using Epinephrine Injection (Auto-Injector). Epinephrine Injection, 0.3 mg (Auto-Injector) is for patients who weigh 66 pounds or more (30 kilograms or more). Epinephrine Injection, 0.15 mg (Auto-Injector) is for patients who weigh about 33 to 66 pounds (15 to 30 kilograms). It is not known if Epinephrine Injection (Auto-Injector) is safe and effective in children who weigh less than 33 pounds (15 kilograms). Please read the Patient Information and Instructions for Use in the accompanying Full Prescribing Information. EpiPen® and EpiPen Jr® are registered trademarks of Mylan Inc.